On a balmy August morning before the city began to fill with summer tourists, Estalyn Walcoff arrived at New York University. She was awaiting a spiritual experience. Walcoff walked into what looked like a living room. A soft brown couch with floral pillows sat in the middle; flowers and books rested atop wooden tables and lined the walls. “It seemed not study-like,” Walcoff said in a YouTube video. Despite its homely appearance, Walcoff knew she had arrived to the place where she was going to be studied for science. Months before, Walcoff had volunteered to participate in a study of how the psychedelic drug psilocybin — the main psychoactive ingredient in magic mushrooms — affects the brain in cancer patients with anxiety and depression. Walcoff, 65, had been diagnosed with an aggressive form of cancer at 60 and struggled for years with debilitating anxiety. Even on good days, her constant feelings of worry and fear hung in the back of her mind like a dark curtain. Inside the study area, Walcoff was greeted by two researchers, New York University psychotherapist Jeffrey Guss and New York University psychologist Seema Desai. The three of them sat and talked in the room for half an hour, going over the details of the study and what might happen. Then, Walcoff received a pill. For study purposes, she couldn’t know whether it was a placebo or psilocybin. Walcoff swallowed the pill with a glass of water. Then she lay back on the soft brown couch and covered her eyes with eye shades as she’d been instructed to do. Within an hour, Walcoff felt feelings of intense panic begin to well up inside her. Then the pain began to ebb slowly away. As the pain left, Walcoff felt another, much more positive feeling take its place. Two years after Walcoff, 27-year-old Nick Fernandez took part in the same study. Perched atop the very same couch this March, Fernandez gradually felt “the blackness inside his head [turn] into a cascade of white dots that swiftly morphed into a kaleidoscope of geometric patterns — gears, stars, triangles, trapezoids — in all the colours of the rainbow,” he told Aeon Magazine. The experience wasn’t simply a slideshow of colourful shapes and patterns, however. It was a physical journey as well. In his mind, Fernandez was lead from a cemetery where he watched his own funeral to Grand Central Terminal, where he danced joyfully to symphonic music with his girlfriend. Shortly thereafter, he plunged again into darkness, this time into the labyrinthine depths of the New York City sewer system. Then he traveled skywards to the crest of the Empire State Building, where he watched the sun rise over the city. Fernandez’s experience is a fairly normal one for patients who participate in the NYU study, the project’s lead researcher, New York University psychiatrist Stephen Ross, told Aeon. 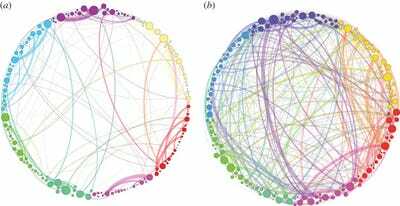 Research on psilocybin is beginning to let scientists understand what is going on inside the brains of people like Fernandez and Walcoff when they take psilocybin. 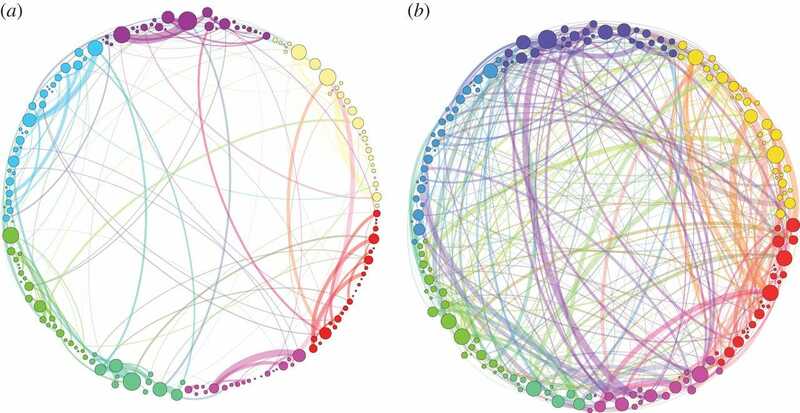 Journal of the Royal Society InterfaceVisualisation of the brain connections in the brain of a person on psilocybin (right) and the brain of a person not given the drug. These new connections are likely what allow users to feel as though they see sounds or hear colours. The brain regions that detect and interpret colour, for example, communicate with the brain region that processes sound. Those same shifts could also be what appears to give the drug its depression and anxiety-fighting qualities.